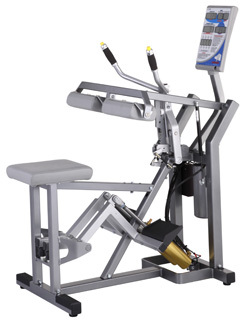 Originally designed for world record holders Willie Banks, triple jump, and Mike Powell, long jump, the Keiser Seated Calf is a unique machine engineered to create explosive power from the lower leg. Its unilateral option and high-speed capability allow for greater results when doing sports specific training. The footpad articulates around the ankle for better range of motion while the machine automatically pre-loads and adjusts for leg length.